From Scratch guests speak openly about their sources of inspiration, set backs, helpful allies, and breakthrough moments. National Public Radio’s From Scratch personalizes the lives of entrepreneurs and provides listeners with candid, first-hand views of launching a business. In the past year and a half, the host, Jessica Harris, has interviewed business pioneers including Kickstarter co-founder Yancey Strickler, artist Chuck Close, and Sesame Street co-founder Joan Ganz Cooney. The podcast’s latest episode, released January 26, featured Etsy’s founder Rob Kalin, and the bearded wonders from Mast Brother’s Chocolate, Michael and Rick Mast. For more on the American craft chocolatiers, check out this beautifully filmed video profile on The Scout. As we all know, Etsy is an e-commerce site that allows its (now 10 million) users to buy and sell their goods for a small fee. Kalin founded Etsy in 2005. At the time, he was a 25-year-old living in Brooklyn and trying to make his living as a furniture designer and maker. While he built an e-commerce site for his own products, Kalin started to think about the power of community. In the podcast, he compares Etsy to agricultural co-ops and the sense of community they often provide. 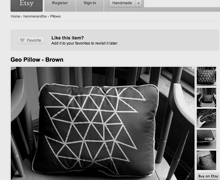 Etsy’s current mission reads, “Like you, we’re bored by the artificiality and ugliness of most products out there.” They hope to connect interesting people with imaginative makers, and the site may just be the easiest platform for designers to test their goods in the marketplace. For just twenty cents, sellers ideas are placed in front of an instant audience. It is the perfect low-risk entry point for a designer who wants to sell products. We spent some time with the From Scratch podcasts and found them inspiring and informative. Listen to the full podcast here, or subscribe on iTunes to browse all 70 episodes.